From afar it may appear like just another cylindrical tower, something like Nairobi‘s Hilton Hotel in Kenya or Manfred Hermer’s Ponte City Apartments in Johannesburg, South Africa. 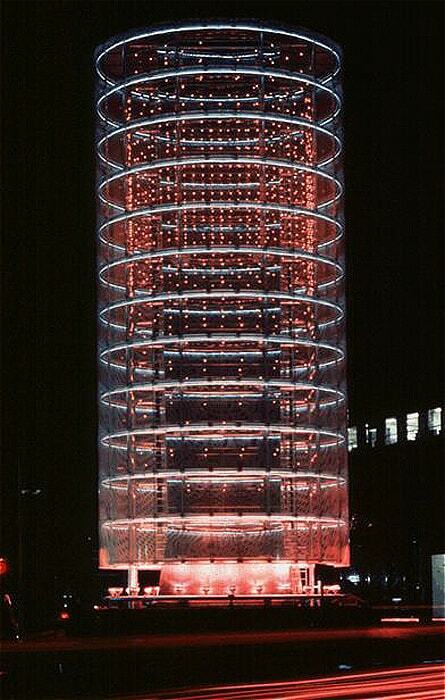 However, Toyo Ito‘s Tower of Winds in Yokohama, Japan is more than just a cylindrical form. It is a first in it’s league of technology bringing together nature and architecture, right in the city! The project sits as a technological sculpture, welcoming travelers arriving at the rail way station of Yokohama. Oddly enough, the tower only houses water tanks serving air conditioning machinery for an underground mall that it sits atop. Now, this project would have just been another warehouse with a blank facade that has no character but Toyo Ito created an icon out of it. Even if it is just a storage house, it still stands as a sovereign piece of architecture that people are going to see and experience. The Tower is a combination of innovation and imagination, particularly because Toyo Ito believes in the importance of technology and its vital role in the future of architecture. It not only forms a dialogue with the city, but also establishes a direct symbolic relationship between nature and the incorporation of technology. 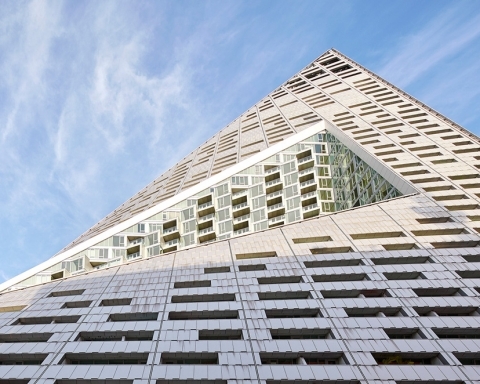 By day the tower, whose facade is clad in perforated aluminum panels, reflects the city through the reflective surfaces covering the steel core. It is a rather complex material to accept due to the glare and heat that is generated especially during the summer. Green architecture nazis would, at the first instance, shun its approach that pays no regard to sun direction or even the possibility of sun-shading elements. To counter that, human thermal comfort is clearly not a pertinent issue here, considering that the residents of the tower are just water tanks. At night time, the Tower of Winds begins to show its true colours, literally. It comes alive, translating sound and wind into light through an automated system that senses the varying wind and noise levels and accordingly powering 1300 lamps, 12 neon rings, and 30 flood lights at its base. Its electricity bill must be quite substantial, but then again, this is its primary spectacle. The tower constantly transforms, its small lamps change colors according the surrounding sounds and its neon rings ripple according to the winds of the city. As a result there is no pattern since the display of light is a direct representation of the environment, portrayed on a 21 meter high cylindrical surface. It earned him the 1987 Edwin Guth Memorial Award of Excellence from America’s Illumination Engineering Society, a prestigious acknowledgement of the strong symbolic value of this work in its urban context. Ito was awarded the project upon winning a competition in which his success is attributed to the ability to convert a purely technical structure into an iconic landmark for the city. Who else?